ZEBULON, N.C. - Rob Henry drove in a run with a double in the fourth and Payton Henry stretched his hitting streak to eight straight games, but the Mudcats fell 5-1 to the Blue Rocks on Sunday afternoon at Five County Stadium. Wilmington's Seuly Matias homered twice in the game for the Blue Rocks as they finished out a series win, by taking three of four, in the four-game set. 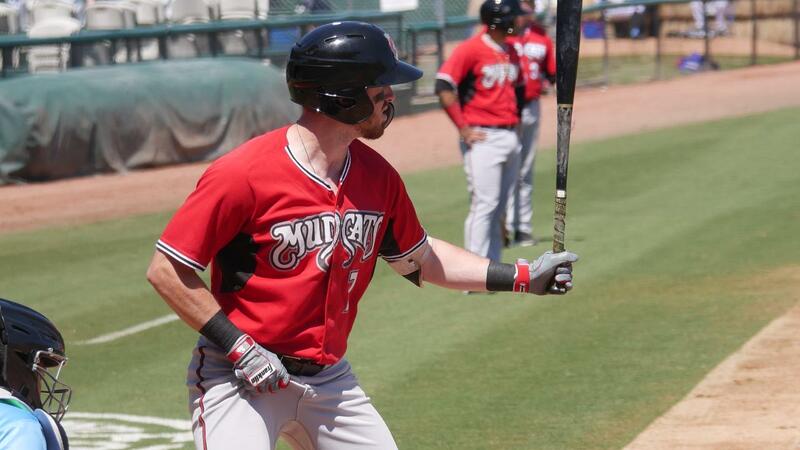 Christian Taugner started for the Mudcats (6-5) on Sunday and ended up suffering the loss after allowing three home runs, including an opposite field homer to Blake Perkins in the first and Matias' big flies in both the fourth and sixth innings. Taugner (1-1, 3.97) pitched in to the sixth inning on Sunday, but would only record one out after leaving the game right after allowing Matias' second home run of the game. Taugner also walked one and struck out two over five and 1/3 innings. The Blue Rocks led the entire way in their series finale and series clinching win. They brought one across to take a 1-0 lead in the first on Perkins' first home run of the season and stretched their lead to 2-0 in the second when Matias hit a soaring blast over the left-center field wall at Five County Stadium. The Mudcats came back with a run in the fourth to get within one of the lead, but would not score again as reliever Collin Snider kept them quiet from the end of the fourth through the seventh. Snider (2-0, 0.90) walked one and struck out four while earning the win following starter Rito Lugo (3.1 IP, 2 H, 0 R , 2 BB, 5 SO) and his spot start. Snider did, however, allow one run to score as he gave up Henry's run scoring double just two batters into his outing. He entered the game with Mario Feliciano at first and then went on to walk Dallas Carroll to put two men on with one out in the inning. Feliciano, who led off the inning with a single, was then picked off second by catcher MJ Melendez for the inning's second out. Feliciano was caught off second moments before Henry ripped his RBI double to left bring in Carroll. Carolina ended up settling for the just one run in the inning while cutting the Wilmington lead down to 2-1. Matias later extended the Wilmington lead to 4-1 with his two-run home run down the right field line in the sixth. The Blue Rocks then added one more to their lead when they rallied for a run off reliever J.T. Hintzen who had replaced Taugner following the two-run homer hit by Matias. Hintzen pitched through just 2/3 of an inning while finishing the sixth and ended up allowing a run and two hits while striking out one. Matt Smith followed with a quick seventh where he retired the side with two line-outs and a strikeout; all of which happening on just six pitches. Newly added reliever Gabe Friese then came in for the eighth, but would not finish the inning after leaving the game following a walk issued to Matias. Friese left the field after the walk and returned to the clubhouse with team Athletic Trainer Matt Deal. It was his first appearance of the season. Reliever Matt Hardy followed and went to work through two scoreless frames with two strikeouts to finish the game for Carolina. Carolina trailed 5-1 after the three run Wilmington sixth and would not threaten to score over the remainder of the game. Snider retired 10 straight following Henry's RBI double in the fourth and lefty Holden Capps worked the final two scoreless frames with three strikeouts to finish out the win for the Blue Rocks. The loss dropped Carolina to 1-3 in its first home stand of the 2019 season. It also clinched as series victory for the Blue Rocks as they took three of four in the series from the Mudcats. UP NEXT: The Mudcats will continue their home stand on Monday night at Five County Stadium with game one of a three game series versus the Fayetteville Woodpeckers. Monday's game will begin at 7:00 p.m. and will feature Carolina's new B.O.G.O. Monday ticket promotion. B.O.G.O. Monday features a buy one (1) box seat ticket and get one (1) free ticket promotion for each Monday night home game throughout the season. The game will air live on the Mudcats Radio Network, the Big Dawg 98.5 FM and online at carolinamudcats.com and TuneIn Radio. It will also stream live in full HD video on MiLB.tv. Tickets are available by calling (919) 269-CATS (2287), by visiting carolinamudcats.com and by visiting the Five County Stadium Box Office.